We find out a couple of things in the chatty article: don't ever invite Zhang Ziyi and FBB to the same party--both will find out beforehand and neither will show; Harvey Weinstein used his own jet to deliver a dress to FBB for the 2012 Oscars; she says she is lazy about learning English, but with a few hundred million fans in China, Hollywood isn't that important. Most importantly, though, she revealed the way to win her heart: "I am known for my hair. But it is my dream to cut it and dye it blue. I’d like to have crazy hair!" She sighed. An envoy from Chopard was knocking at the door with diamonds for her, and the tailor from Valentino was ready with the lace gown that she had agreed to wear that night. "If I ever find a boyfriend who lets me cut my hair and dye it blue, I will marry him," she said as she went to answer the door. 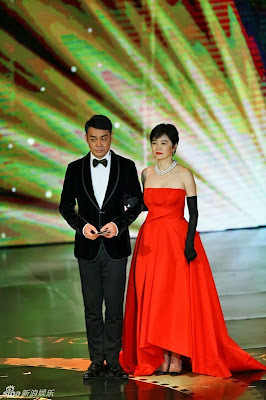 After making over 70 movies in Hong Kong--most of them during the late 1980s to mid 1990s cinema production explosion in the years leading up to the Handover--Rosamund Kwan retired to either a) get rich running her real estate company; b) marry a Taiwanese billionaire or c) something else entirely. One can find plenty of articles in English and probably many more in Chinese attesting to those not completely factual facts. Whatever has been keeping her busy, she looks, at 51, ready to step in front of the cameras as Aunt 13, Ms. Pak or Snow White and gave the diva-starved masses a glimpse of how to look like a movie star a decade or so after your last movie. This was at an "Esqure" magazine event that, according to some but not all of the coverage, was to help publicized the need for adoptions in China. 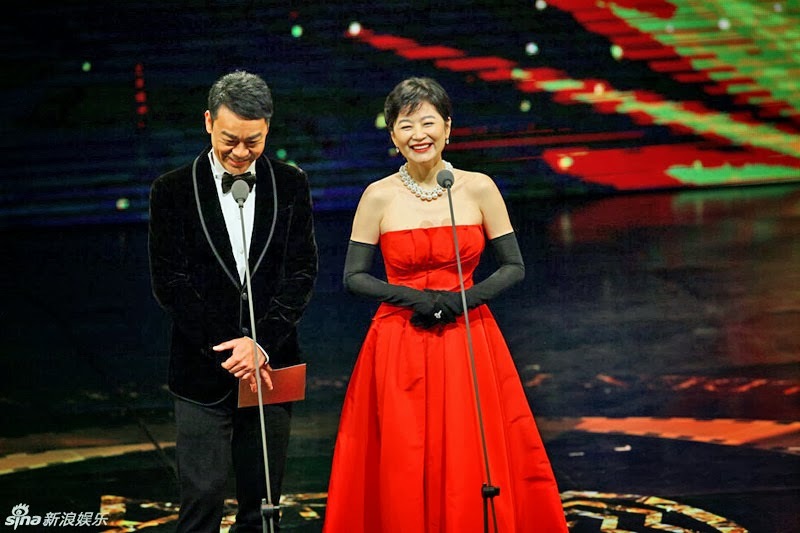 Taipei knows how to throw a party and welcomed the world's entertainment press to record beautiful people looking beautiful while celebrating another year of the domestic film industry in Taiwan surviving the Hollywood juggernaut, perhaps not unlike the ROC facing the unstoppable force across the Taiwan Strait. Winners in the big categories came from Malaysia, Singapore, Hong Kong and Taiwan itself. 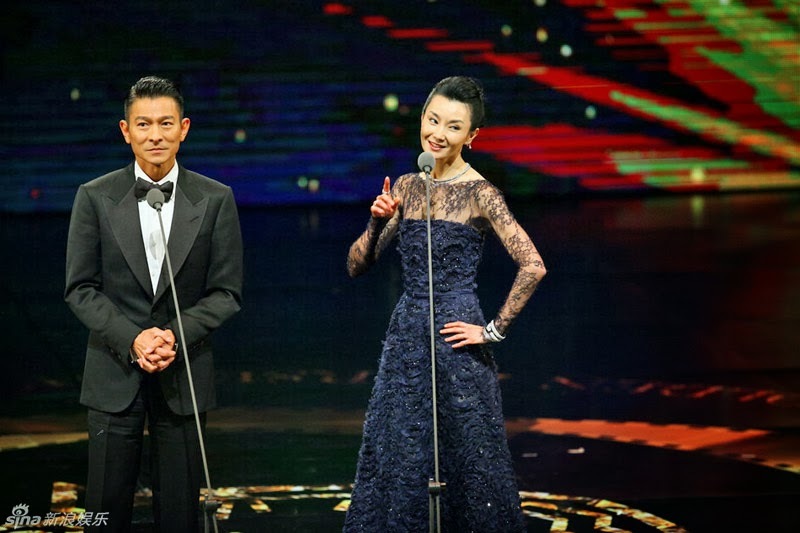 Zhang Ziyi, who was in no danger of becoming the Chinese Susan Lucci, picked up the Best Actress statuette on her fourth nomination for her portrayal of Gong Er in "The Grandmaster" and thanked director Wong Kar-wai "for allowing me to encounter Gong Er at the most difficult time of my life and for encouraging me to be brave and believe in myself."